New advances in understanding the dynamics of ice sheets in the most remote polar regions of the world have been made possible by technological advances in GPS systems. Eight new GPS stations, designed and built by UNAVCO as a result of the 3 year NSF funded Major Research Instrumentation (MRI) Project Collaborative Research: Development of a Power and Communication System for Remote Autonomous GPS and Seismic Stations in Antarctica, were recently deployed on the West Antarctic Ice Sheet and the Antarctic Plateau as part of 5 high-profile glaciological research projects. These eight systems, all mounted on ice, are unprecedented in their ability to operate autonomously, year-round in extreme cold with satellite communications for real time data retrieval. Equipment boxes on the Polar Plateau are heated and sealed with vacuum insulation so that the temperature inside the box stays warm despite outside temperatures below -50°C. System size and weight are kept to a minimum in order to ease transport to remote locations. These new systems allow scientists to obtain GPS position data from the most remote polar ice sheets in the world in a more cost effective and efficient manner. Dr. Slawek Tulaczyk is a professor of Earth Sciences at the University of California-Santa Cruz and the lead Principal Investigator on a project to investigate two lakes, Lake Mercer and Lake Whillans, located under the vast West Antarctic Ice Sheet (WAIS). Tulacyk notes in a recent NSF highlight that once geophysical data sets including GPS from the ice above subglacial lakes and rivers on the WAIS are processed, the science team will be able to quantify dynamics of subglacial water flow beneath the ice sheet and verify if dynamic water flow between these subglacial lakes induces changes in the sliding rate of the overlying ice sheet. The Norwegian-U.S. Scientific Traverse of East Antarctica is a project to perform scientific investigations on climate change along two overland traverses in East Antarctica. 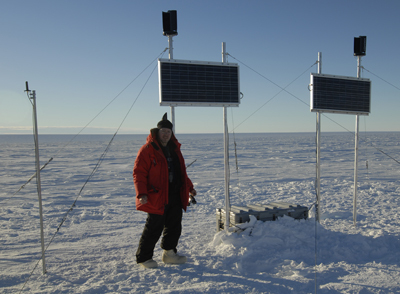 During the February 2009 traverse from the South Pole to the Norwegian Troll Station, project co-PI Ted Scambos of the National Snow and Ice Data Center installed two new UNAVCO GPS systems above subglacial lakes in the Recovery Lakes region of Antarctica. Scientists will use high-precision GPS data from these stations as they research ice surface movement and hopefully discover the role this extensive subglacial lake system plays in the dynamics of the East Antarctic ice sheet. For more information on the MRI development effort visit the UNAVCO and IRIS/PASSCAL Polar Technology websites. All continuously collected data are openly available and can be accessed via Data at UNAVCO. Figure 1 - GPS record of ice surface elevation changes (brown symbols, left scale) and the rate of elevation change (green lines, right scale) above subglacial Lake Mercer, located under the West Antarctic Ice Sheet. 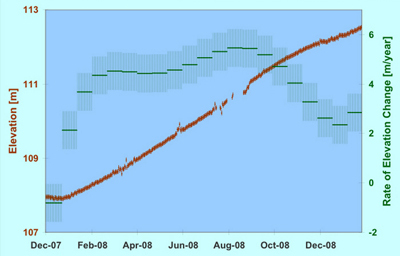 The rate of elevation change was averaged for 20-day intervals; uncertainties are shown by error bars as one standard error. Figure provided by Slawek Tulaczyk. 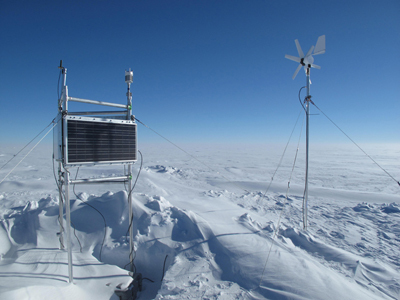 Figure 2 - GPS station REC2, located at the Recovery Lakes region of the Antarctic Plateau. Solar panels and lead-acid batteries provide power for a majority of the year, with wind power and lithium battery backup to ensure data collection continues through the polar winter. This system uses a super-insulated enclosure to conserve heat, and near real-time data retrieval is obtained via the Iridium system. Figure 3 - GPS station PIG1, located at the Pine Island Glacier in West Antarctica. Except for a few weeks data outage, this station has delivered a continuous dataset since its installation in January 2008. This station uses solar panels, small wind turbines, and a moderately sized bank of lead-acid batteries.